The Grand Tetons in Wyoming may be the most spectacular mountain range in the West, and we’ll explore the beautiful wilds of this famous realm of sky-scraping peaks,snowfields, lush forests and meadows, roaring streams and alpine lakes. Wildflower blooms are spectacular. 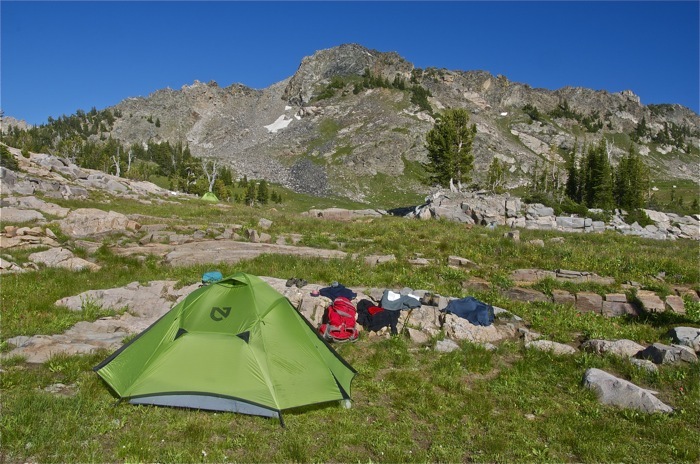 Our routes are primarily within the verdant and wild Jedediah Smith Wilderness, in the Targhee National Forest, the west slope of the Tetons, which borders Grand Teton National Park. Moose, bighorn sheep, marmot, pika, bear and other native species thrive here. Rugged high mountain scenery and views are unsurpassed! With plenty of ups and downs but moderate mileage, the 6-day July trek is fairly strenuous to strenuous. The 5-day September trek is also really spectacular, but is rated moderate. Both are based in Jackson, Wyoming. 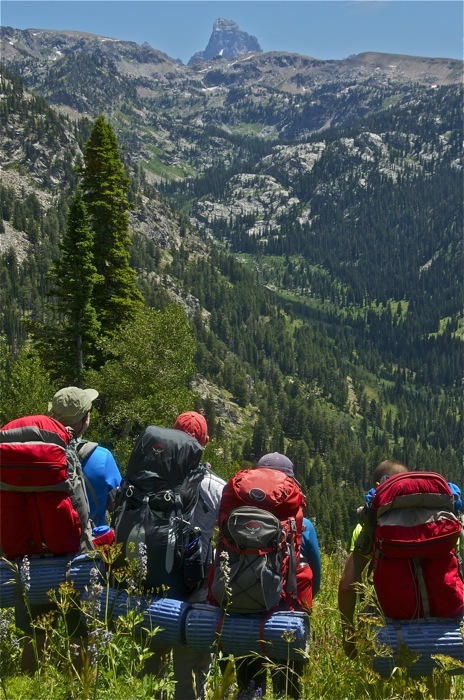 These treks are in the central and northern portions of the Tetons, and a portion of each route will be along the spectacular Teton Crest Trail. The Jed Smith Wilderness is the wild side of the Tetons, more remote and less heavily traveled than the adjacent national park. TREK BASE: Jackson, WY. Antler Motel, 43 West Pearl, 800-522-2406 or 307-733-2535. Make reservations early; if the motel is full, they’ll place our clients at a nearby motel owned and run by the same people. MEETING TIME: Pre-trip orientation and safety talk plus food/gear handout at 6 PM the evening prior to the first day of the trip. So if the trip is from the 21st to the 26th, we meet at 6 PM on the 20th, in the Antler lobby. TRANSPORTATION: Fly to Jackson, cabs to motel available upon arrival. Make flight reservations early because summer flights fill quickly! Alternatives: fly to Salt Lake, Idaho Falls or Bozeman and rent car. For bus/van service from Salt Lake or Idaho Falls to Jackson, call Jackson Hole Express, 800-443-6133 or 307-733-1719. TREK RATING: This July trip is fairly strenuous to strenuous, with modest mileage but lots of ups and downs. Daily backpacking miles are in the 6-8 mile range, mostly on good trails. There will be 1 planned layover. The September trip is easier and is rated moderate. ELEVATIONS: 7,000-10,000 feet, with opportunities (weather permitting) for higher jaunts to alpine summits. Maximum one-day elevation gain with backpacks is about 2,200 feet for the July trek and about 1500 feet for the September walk.. WEATHER: Classic high mountain weather, usually with lots of summer sun. Afternoon thunderstorms are frequent, but usually fairly brief. Cool to cold nights. Be ready for anything, including very rapid changes. Click here for the National Weather Service forecast. SPECIAL FEATURES: Our trips are primarily within the Jedadiah Smith Wilderness, which encompasses the west slope of the Tetons. These mountains are incomparably spectacular! Snow-clad glaciated peaks like none others. Below the peaks is a lush wilderness of coniferous forest, aspen and some of the grandest wildflower meadows anywhere on Earth! Part of the route is on or adjacent to the Grand Teton National Park border, along the incomparable Teton Crest Trail, one of the great high mountain walks anywhere! On the September trip, the transition into autumn is magical, with bull elk bugling, no biting insects and a tinge of frost in the early morning air! SPECIAL TIPS: Bring plenty of sun protection. This is bear country, so avoid deodorants and other smelly substances. 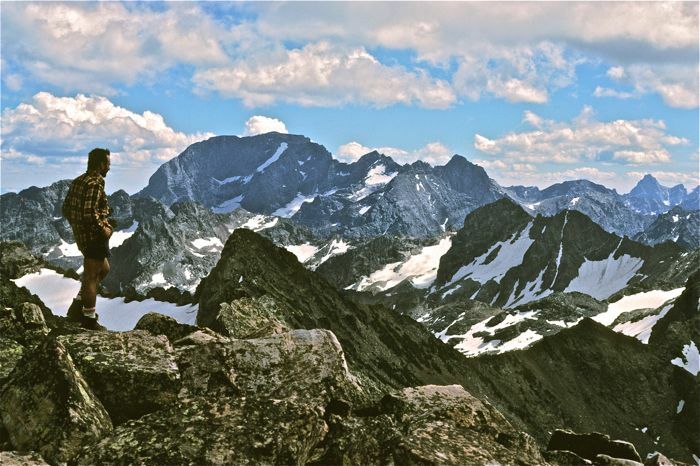 STATUS: Big Wild co-owner Howie Wolke helped to get the Jed Smith designated as a Wilderness area back in 1984, though the Grand Teton National Park backcountry has yet to be protected as Wilderness by Congress. ITINERARY: We generally go from “point A” to “point B”; the trailheads are about an hour from Jackson, and we’ll drive through Idaho. Please Note: We vary our routes as conditions dictate, so mileages and elevations are approximate.